« A Taste of British Flare Has found Its Way to the Lowcountry! Escape to the island as High Thyme introduces Happy Hour specials starting this week on Tuesdays through Saturdays from 5pm-7pm. The popular upscale island dining destination will offer $1 off beer, $2 off twenty-five wines available by the glass and $2 off liquor drinks. Patrons can also relish in $2 off the selection of delicious appetizers that include Steamed Mussels, Pan Seared Scallops, Crispy Pork Belly and much more. High Thyme is a perfect spot at happy hour to grab an after work drink in the cozy bar or have a meal on the deck overlooking the quaint island scenery. As one of Sullivan’s Islands best kept secrets for many years, High Thyme Cuisine and Cocktails offers a blend of ingredients that are just as tasty as a home prepared meal while on vacation or just enjoying another day at the beach. 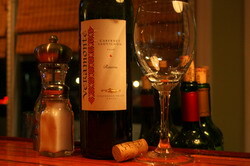 Executive Chef Taylor Still delivers quaint island cuisine that gently blankets the taste buds. From the freshest fish, beef, chicken and pasta to many unique salads and appetizers, there is always something for everyone at High Thyme. 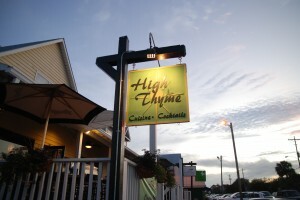 For more information about High Thyme, visit www.highthymecuisine.com. This entry was posted on August 19, 2013 at 5:02 pm and is filed under Sales & Events with tags beer charleston, Charleston, charleston bars, charleston events, charleston happy hour, charleston restaurants, High Thyme Cuisine, High Thyme Cuisine and Cocktails, Kenny Jones, sullivan's island, sullivan's island restaurants, sullivans island happy hour, taylor still, www.highthymecuisine.com. You can follow any responses to this entry through the RSS 2.0 feed. You can leave a response, or trackback from your own site.